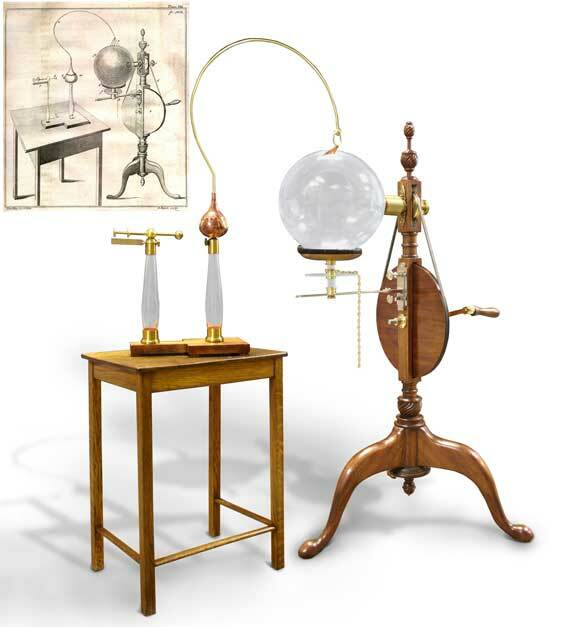 While he is most well known for his discovery of oxygen, Joseph Priestley wrote the first comprehensive history of electricity, published in 1769. The book includes a detailed description of several static electricity machines. He was so taken with one of the designs that he decided to manufacture and sell it. The machine is shown below left in a copperplate illustration from Priestley's book. Since no complete examples of this machine survive today, I decided to construct a faithful reproduction of the machine, using the illustration and description in his book as a guide. I had the wood base carved by Lee Grindinger, a very talented furniture maker from Montana. The glass was blown by Seattle artist David Smith of Blowing Sands Glass Studio. I did the rest of the work myself. The machine stands a little over three feet tall.